Husband and wife team Jeff and Belinda Bull run their Chevy S10 pick-up in Super Comp. A long-standing sponsor of Eurodragster.com's Swap Meet, Jeff Bull is kept busy juggling his race engine and parts business as well as holding down a full time job. Peter Donaldson interviewed Belinda and Jeff at the UK Truck Show where Belinda ran her first seven-second passes in front of the appreciative crowd. Eurodragster.com: When did you both first get involved in drag racing? 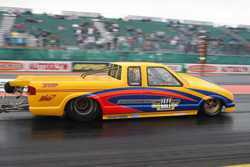 Jeff: For me it was in the early 1980s when I had a '55 Stepside pick up truck and took it to Run What You Brungs at Santa Pod. We got involved in the racing together when we bought a '69 Camaro from Terry Gibbs in 1990 and I raced it in Super Gas. Belinda: Jeff first took me to a RWYB on a cold, miserable Sunday afternoon in 1989, I wasn't impressed! We bought In The Red in 1990 and Jeff raced in Super Gas for about three years and so from there I got more involved in the racing. I'd also help out when Jeff went on to crew for Terry Gibbs and Jon and Sharon Hogarth. My switch from spectator to driver came about around Christmas time in 2003 when I was asked by fellow Super Comp racers Dave and Sarah Day if I'd ever fancied racing myself. My reply was that I'd always been happy spectating and helping out at the track and had never really given it a thought. Jeff had already bought the ex-Simon Payne '68 Camaro at this time and wasn't sure if he'd have the time to race it himself. Before I'd even had chance to finish "Go on then, I'll give it a go" he'd got made to measure firesuit, crash helmet, boots etc. on order for my birthday and we were preparing for my first RWYB. The powers of gentle persuasion! I started racing in 2004, when I went straight into Super Gas in the Camaro. Eurodragster.com: Tell us about yourselves. Belinda: Jeff and I have been together almost nineteen years. He has three children, Tamara, Rick and Jody and we have a grandaughter Reanna, who is my number one fan, and grandson Cole. I work as a receptionist/secretary at a local firm, Britannia Storage Systems, who specialise in the design and manufacture of mobile storage systems. I'm really lucky that my bosses are so flexible when it comes to taking time off for my racing. Jeff: My full time job is as a Contracts Plant Manager for a local earthmoving company and involves the running and repairing side of all types of earthmoving equipment (anything from three ton mini diggers to eighty ton excavators) on major projects throughout the UK. Terminal 5 at Heathrow, the Channel Tunnel Rail Link and now the Olympics site in London are just a few of the many large contracts I've been working on recently. Eurodragster.com: How do you fit your drag racing into your lifestyle? Belinda: Well, it's only a few weekends out of the year so it fits in OK really. We try and catch up with family and friends as much as we can in between meetings and we always take our well earned holiday when the racing's finished for the year. 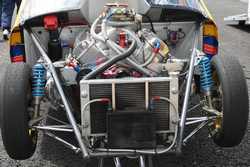 Eurodragster.com: Jeff, you are a highly respected race engine builder, how did you get started? Jeff: It all started in 1990 when I put my first race motor together, it was a 510 cu in for the In The Red Camaro. It has grown from there. Eurodragster.com: Tell us about some of your customers past and present? 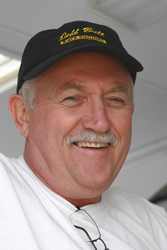 Jeff: Terry Gibbs was my first drag racing customer followed by Jon and Sharon Hogarth. Present customers include Mick Smith, Spencer Tramm, Jon Morton, Malcolm Francis, Dave Day, Shaun Lathan, to name a few. 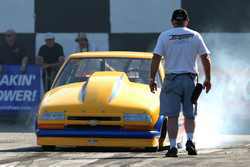 There are many, many more in drag racing, past and present, too many to mention them all. I've also built motors for Formula 1 stock cars and other forms of motorsport. I'm pleased to say that we have made some very good friends through the engine building over the years. Eurodragster.com: Belinda, you run in the Super Comp class, how successful have you been? Belinda: Last year I was third in the Santa Pod Racers Club Championship, which I didn't expect at all for my first year in the truck, and I was ninth in the National Championship. This year I wanted to improve on those positions and had a great start to the season with my win at the Easter Thunderball (and more recently was runner up at the Open Sport Nationals at Shakespeare County Raceway). Eurodragster.com: You ran your first seven at the Truck Show. Are you tempted to enter any other class? Belinda: Running in the sevens was a great feeling but I'm loving it in Super Comp at the moment. There is such camaraderie in the class, the guys are all great. Not sure that I'd be tempted to go elsewhere really. We'll see though, Jeff may have plans for me for next year that I don't know about, who knows? Eurodragster.com: Tell us about the car. Jeff: The truck is a 1998 Chevy S10 and was built by Jerry Haas for Brad Jeter who took it to runner up spot in the 1999 NHRA Pro Stock Truck Series. He later sold it to Bob Panella and in November 2003 Robert Joosten bought the truck from Bob Panella and campaigned it very successfully in Super Gas and Super Comp in 2004/5. We were in the right place at the right time when the truck came up for sale again, after Robert bought his Oddy's Pro Mod Corvette from Fil Papafilippou from Greece. We took delivery of the truck from Greece just before Christmas 2005. Eurodragster.com: What are your best ET and speed? Belinda: I ran a 7.95 at the UK Truck Show, and my best mph is 171. Eurodragster.com: Jeff, does the car require much maintenance between events? Jeff: No, apart from the usual necessary checks, it's pretty low maintenance. 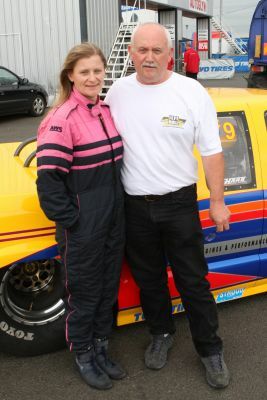 Eurodragster.com: Belinda what do your family and work colleagues think about you being a drag racer? Belinda: My Mum has become a real fan, she's not been to the track to watch just yet but she always follows the events I'm at on Eurodragster and keeps the rest of the family up to speed with how I'm doing. The guys at work think what I do is pretty cool and quite a unique thing to know someone involved in drag racing. Eurodragster.com: What are your plans for the future? Belinda: To improve on my 2006 Championship positions. Eurodragster.com: What single thing (apart from the weather) would you like improving in UK drag racing? Belinda: Apart from the weather? If only! Indoor drag racing would be great in this country wouldn't it? Belinda: Jeff Bull Race Engines, Doug Herbert Performance, Transmission Specialities, Britannia Storage Systems Ltd.
Eurodragster.com: Is there anybody you would like to thank? Belinda: Personally I'd like to thank Jeff for all his hard work and for letting me have the driving job! Also thanks to Doug Herbert for the help and deals on parts, the guys at Transmission Specialities for the great transmissions and converters, Joe and the guys at Bo Laws, Peter and Joe at Britannia Storage Systems for their support this season, all the hardworking guys and girls at Santa Pod and not forgetting Eurodragster.com for the great event coverage. Jeff: Belinda, family and friends that have been there for me over the years, and customers past and present. Eurodragster.com: Thank you very much for your time. Feature ©Peter Donaldson for Eurodragster.com.